For just as the body is one and has many members, and all the members of the body, though many, are one body, so it is with Christ. For in one Spirit we were all baptized into one body—Jews or Greeks, slaves or free—and all were made to drink of one Spirit (1 Corinthians 12:12-13 ESV). When we are baptized and filled with the spirit of God, Jesus says that we are born again and may enter the kingdom of heaven (John 3:3,4,5). In other words we are born into the kingdom of heaven. Husbands, love your wives, even as Christ also loved the church, and gave himself for it; That he might sanctify and cleanse it with the washing of water by the word, That he might present it to himself a glorious church, not having spot, or wrinkle, or any such thing; but that it should be holy and without blemish (Ephesians 5:25-27 ). When one who is born in a certain country, the person is a citizen of that country. When the child of God is born into the kingdom of God, he/she becomes a citizen of heaven. When this occurs, as ambassadors for Christ we represent heaven, giving us the right to occupy heaven's embassy, which can only be the glorious church that Jesus gave His life for. 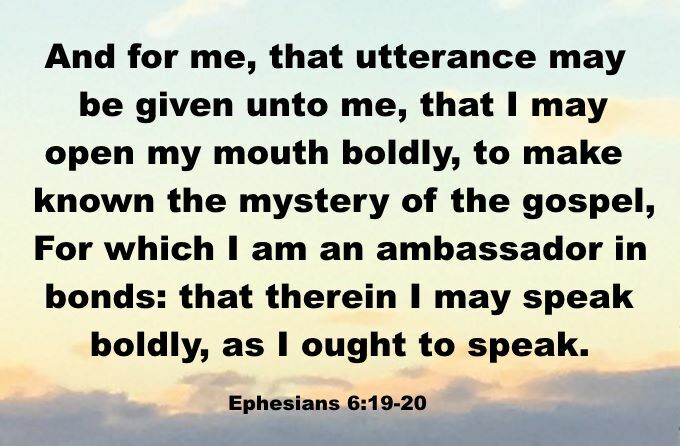 And for me, that utterance may be given unto me, that I may open my mouth boldly, to make known the mystery of the gospel, For which I am an ambassador in bonds: that therein I may speak boldly, as I ought to speak (Ephesians 6:19-20). ... upon this rock I will build my church; and the gates of hell shall not prevail against it (Matthew 16:18). And he said unto them, Go ye into all the world, and preach the gospel to every creature. He that believeth and is baptized shall be saved; but he that believeth not shall be damned. And these signs shall follow them that believe; In my name shall they cast out devils; they shall speak with new tongues; They shall take up serpents; and if they drink any deadly thing, it shall not hurt them; they shall lay hands on the sick, and they shall recover. So then after the Lord had spoken unto them, he was received up into heaven, and sat on the right hand of God. And they went forth, and preached every where, the Lord working with them, and confirming the word with signs following. Amen (Mark 16:15-20). 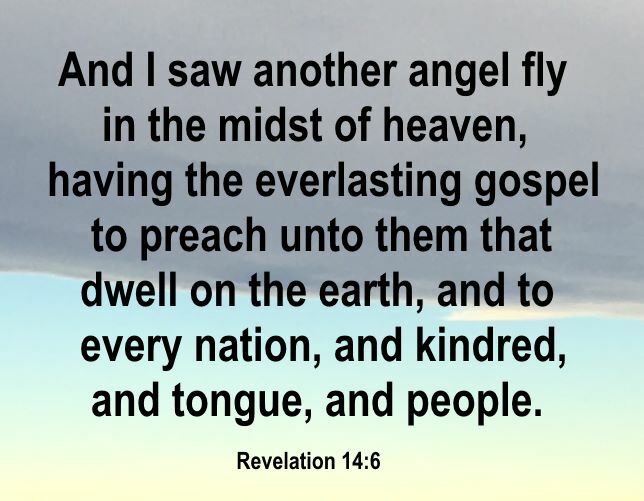 And I saw another angel fly in the midst of heaven, having the everlasting gospel to preach unto them that dwell on the earth, and to every nation, and kindred, and tongue, and people (Revelation 14:6). So after 2000 years, it is still beautiful to watch the church as it literally circles the globe performing the duties of heaven’s embassy. These things have I spoken unto you, that my joy might remain in you, and that your joy might be full (John 15:11). Can you imagine if you were in a foreign country and you walked into the embassy of your country and found that the person inside representing the embassy was unfriendly and negative? Of course we would be worried and maybe even experience despair. What we would expect instead though would be to meet somebody who is personable, positive and proud to represent his country. We would want the person to have a little compassion, maybe be empathetic or sympathetic for our situation. We would think the person would offer whatever help and assistance we needed, to provide as much safety and comfort as the person possibly could. When the Saints of the church, ambassadors for Christ, meet people in the world, we need to be personable, positive and energetic and be proud to represent Jesus. We need to portray a good image of the church since we represent heaven to this world. We must always be ready to help and assist others. Having empathy and sympathy for lost souls shouldn’t be that hard when you consider where we came from ourselves. 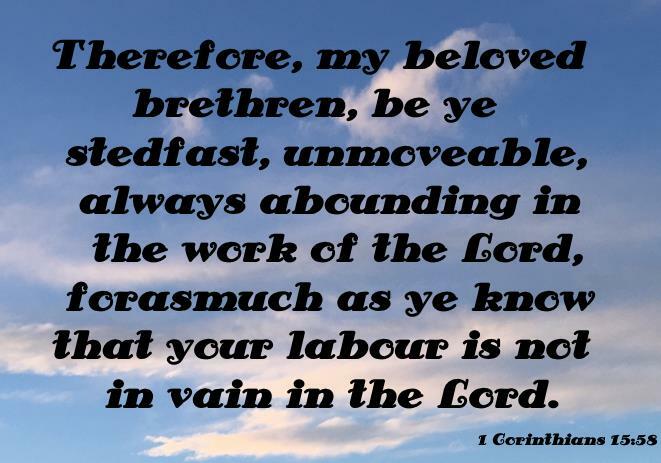 Therefore, my beloved brethren, be ye stedfast, unmoveable, always abounding in the work of the Lord, forasmuch as ye know that your labour is not in vain in the Lord (1 Corinthians 15:58). Countries of the world establish embassies to conduct business on their behalf on foreign soil. One of the more common services that citizens receive from an embassy is the acquisition of a passport. After receiving the passport, it is compulsory for one to return to the embassy at certain intervals to update and validate it. Likewise God placed the church in this world to conduct the business of heaven. One of the primary services of the church is to preach and teach the Kingdom of God and the Gospel of Jesus Christ to the lost and dying world. The church is their only true hope, and its primary reason for existence is to conduct the business of preaching the plan of salvation. To obtain a heavenly passport, it is essential to be born again – to have repented, to be baptized in the lovely name of Jesus, and to receive the glorious gift of the Holy Ghost. Wherefore the rather, brethren, give diligence to make your calling and election sure: for if ye do these things, ye shall never fall: For so an entrance shall be ministered unto you abundantly into the everlasting kingdom of our Lord and Saviour Jesus Christ (2 Peter 1:10-11). For all the promises of God in him are yea, and in him Amen, unto the glory of God by us. 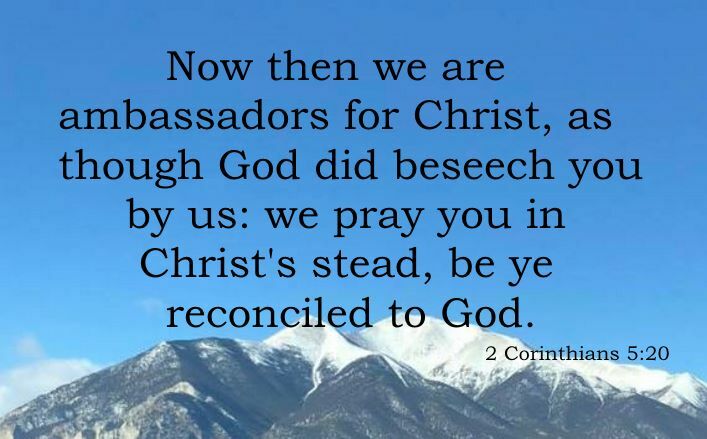 Now he which stablisheth us with you in Christ, and hath anointed us, is God; Who hath also sealed us, and given the earnest of the Spirit in our hearts (2 Corinthians 1:20-22). Often people meet individuals from their home country at the embassy. After a while one develops a sense of community and a feeling of closeness. It is common in these situations to gather together for special occasions such as Christmas and Easter. Although there reasons for being in that particular country may vary, there is a common denominator – they all come from the same country. Many times, because of the embassy, these people actually become friends and become an extended family. Of course this is a wonderful analogy for the church! We all come from different backgrounds with a host of different personal interests. Although the nature of our work and employment varies greatly, the church becomes a community. We develop a closeness that transcends culture, employment and personal interests. In fact the fellowship, caring, compassion and concern within the church community helps to keep us in the Kingdom of God. 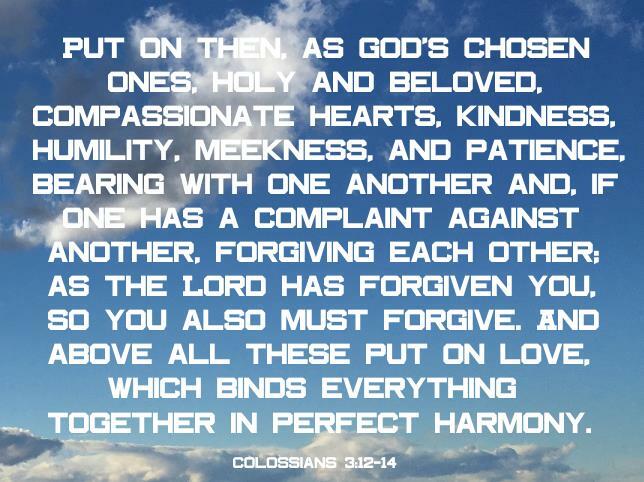 Put on then, as God's chosen ones, holy and beloved, compassionate hearts, kindness, humility, meekness, and patience, bearing with one another and, if one has a complaint against another, forgiving each other; as the Lord has forgiven you, so you also must forgive. And above all these put on love, which binds everything together in perfect harmony. And let the peace of Christ rule in your hearts, to which indeed you were called in one body. And be thankful. Let the word of Christ dwell in you richly, teaching and admonishing one another in all wisdom, singing psalms and hymns and spiritual songs, with thankfulness in your hearts to God. And whatever you do, in word or deed, do everything in the name of the Lord Jesus, giving thanks to God the Father through him (Colossians 3:12-17 ESV).